The Auld Bothy Cottage is very much a romantic retreat, delightfully situated within the stunning grounds of historic Raehills, this ecologically friendly cottage has been beautifully restored to provide superb self catering accommodation for two. The cottage is approached off the private mile long drive of Raehills, beside the walled garden, with beautiful views of the River Kinnel, and enjoys a peaceful and idyllic location. Guests are encouraged to treat the exclusive parkland and gardens of Raehills as their own and to explore and enjoy them. 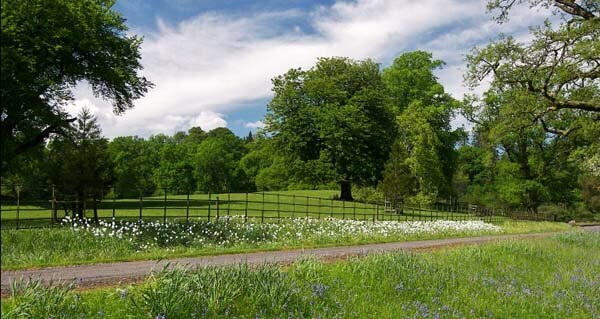 Step out of the front door and into the private parkland, with beautiful walks in the peaceful countryside. There is an abundance of fallow and roe deer, peacocks and red squirrels. This tranquil retreat is also a joy also for those with four legged friends, with woods to explore and lakes to swim. For garden enthusiasts or those wishing a peaceful seat, guests are free to wander and relax in the pretty walled garden. For those who like to fish, you can fish on the estate in the Kinnel river or on a stretch of the river Annan, with salmon, trout and grayling fishing free to all guests. The cottage is easily reached as it is halfway between Moffat and Dumfries, with excellent links to the rest of Scotland and the north of England, lying just 10 minutes from the A74M motorway. Nearby Lockerbie has a main line railway station with direct services to Glasgow, Edinburgh and the south. Also close by, the former spa town of Moffat enjoys a wide range of shops, pubs and award-winning restaurants. Perfect for getting away from it all, the surrounding area has activities for everyone, from mountain biking and hill walking on the estate and in the Ae Forest (part of the 7Stanes biking network), to fishing and stalking and enjoying a round of golf on numerous local courses. A tennis court is available in the gardens of Raehills. Horse riding and sailing are also available locally. History lovers will be at home in Burns and Reivers country, close to many sites of historical interest including Caerlaverock and Drumlanrig castles. Auld Bothy Cottage is an idyllic romantic getaway for two, situated on a stunning private estate in south west Scotland. Newly restored, it sits in the woodland of Raehills beside the walled garden and close to the river. It has a private driveway with parking, a barbecue patio and terrace where you can sit outside and relax whilst enjoy the amazing view. The traditional front door opens into the hallway with a cloakroom and utility room which includes washing machine and tumble dryer. The beautiful oak floor continues through to a spacious open plan kitchen/dining/sitting room with a wood burning stove - perfect for cosying up in front of for a romantic evening! The cottage is tastefully decorated and very comfortably furnished. The oak staircase leads you up to the pretty bedroom with king size bed. From here you can enjoy lovely views down to the river. There is a large en-suite bathroom with rolled top bath and a separate shower and toilet. The house has the benefit of an air sourced heat pump which feeds the under floor heating and hot water, which keeps it cosy at all times. The latest ecological techniques and natural materials and paints were used for the restoration. Perfectly situated, minutes from the A74M motorway. Exit at Junction 15 A74M. Follow A701 in the direction of Dumfries for approx 6 miles. At the traffic lights, cross St Ann's bridge turning immediately right through white gates at the lodge house. Follow the mile long drive, on approach to the big house turn left for 150 metres bringing you to Auld Bothy Cottage, Raehills. Heating, electricity and logs for the stove are all included. Quality bed linen and towels are provided. Pets are welcome - a bed and dishes can be provided on request. This stunning self-catering cottage at Raehills is rented out year round. Change over day is Sunday, check in from 4pm, checkout by 10am. To book this romantic cottage near Moffat click the enquiry button below to see cost and availability. This stunning 5 star cottage set in a large country estate in southwest Scotland is perfect for a Scottish honeymoon. The estate offers great walking, cycling, tennis and fishing - shooting can also be arranged.